Comedian Seth Meyers recounted stories of canceled trains and gun tornadoes at his Family Weekend show on Saturday to a highly receptive crowd. 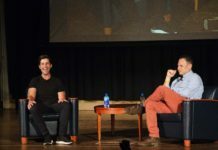 The “Late Night” host and former “Saturday Night Live” star performed an hour-long set to a crowd of more than 4,000 at the Thomas M. Ryan Center. 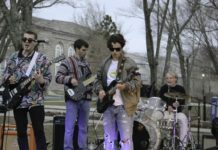 He opened his set with a recollection of his previous trip to the University of Rhode Island in 2005. After he and fellow “Saturday Night Live” cast member Kenan Thompson had their train to Rhode Island canceled, they resorted to renting a car. However, they did not have appropriate identification between them: Meyers did not have a driver’s license, and while Thompson did, he did not have a credit card. After the manager of a car rental recognized Thompson from his Nickelodeon show, the duo was eventually able to negotiate a car rental for the pair. Other highlights of the night included topical jokes about European debt, ebola and gun control. Meyers joked saying that there were some people in the United States that would never be convinced that there are issues with gun control and climate change. As an example of this, he joked that a tornado could pick up every gun in the country and randomly shoot them, and some would still give tangential reasons for the disaster instead of admitting there are gun and climate problems in the country. In one of his best bits, Meyers discussed his performance at the 2011 White House Correspondents Dinner, one day before the death of Osama Bin Laden was announced. Meyers said that he was proud of his job hosting and thought he would be the lead story on the morning news. He joked that he was the only person in America with an exasperated reaction to Bin Laden’s death. This segment of his show included several different versions of the same joke. Most of the variations received a warm reception for their dark or off-color humor. Meyers’ performance was simulcast on large video screens on either side of the stage. While there were some intermittent glitches during the show, they were ultimately a successful addition and gave concertgoers in less-than-opportune seats a chance to see Meyers up close. 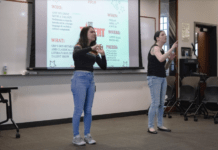 Overall, Meyers’ set was one of the best comedy performances URI has seen in some time. His humor and subject matter were especially complementary to the Parent’s Weekend atmosphere. The next major entertainment event on campus is an appearance by “America’s Got Talent” winner and URI alumnus Mat Franco on Dec. 5. Tickets to the Edwards Auditorium show are $5 for students, and they can be purchased from the Memorial Union box office.